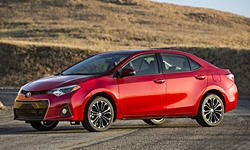 See TSBs and recalls for the 2015 Toyota Corolla. $80 Jump started the dead battery after the car was parked for 3 weeks. The gps tracker drained the battery. The radio stopped working after jump start. Dealer fixed radio for free. 16000 mi Annoying rattle in steering wheel area and rear passenger side of vehicle when going over bumpy roads. 19000 mi Rattle never fixed. 4000 mi Rear shock absorbers were both leaking and were replaced. 2000 mi Rear windshield defogger grid was broken when purchased car brand new. Toyota replaced rear glass. 5800 mi Corrosion to up level alloy wheels. Dealership attempting to get warranty coverage for replacement of 2 wheels. Claim pending. Warranty coverage for corrosion to wheels denied by Toyota. Claim filed for arbitration. Claim resolved. C $700 2 front tires were repaired due to holes on the side. non reparable . replaced with 2 new tires. 12000 mi The cover for the electrical console on the passenger's side seat bent and needed to be replaced. It was covered by warranty. 38000 mi Car wouldn’t start. Needed battery replaced . See our lemon odds and nada odds page to see vehicles with no repairs or vehicles with more than three repairs. To see how frequently 2015 Toyota Corolla problems occur, check out our car reliability stats.